The last couple of weeks have seen the conclusion of the various State leagues that occupy the first few months of each Brazilian season. Previous Letters from South America “Robinho smiles again” and “Pragmatism 0 Attacking Football3″ reported how Santos did the hard bit well, finishing top of the league stage then knocking out Sao Paulo in the semi-finals with very impressive attacking football. However Santos found doing the easy bit much harder. The previous LSA suggested that final opponents Santo Andre were of the same standard as Partick Thistle. But as Celtic found out in the Scottish Cup just because your opponents are a level below you, doesn’t mean all you have to do is turn up to triumph. The first leg, away from home was an exciting game with an attack-minded Santos finally winning 3-2. Some 35,000 Santos fans including the legendary Pele, turned up for the second leg of the Final at their own Vila Belmiro stadium expecting a leisurely afternoon of joy, goals, victory and celebration. Manager Dorival Junior once again reverted to a more defensive 4:4:2 formation for the home leg, putting winger/full back Wesley into midfield and bringing in a more conventional full back and leaving young centre forward Andre on the bench. Santo Andre soon spoiled the party atmosphere scoring in the very first minute. Neymar soon equalised with a goal of usual brilliance but within 20 minutes Santo Andre went ahead again. Once again young Neymar displayed his genius crafting an excellent equaliser but in the second last minute of the first half Santo Andre took the lead for the third time. With away goals cancelling out, Santos knew that even a 3-2 defeat would see them crowned champions based on their better league performance but one more goal conceded and Santo Andre would be champions. So the scene was set for a tense second half. The Santos left back Leo, of Benfica fame, had been sent off in the first half along with a Santo Andre forward so both sides were down to 10 men. Midfielder Marquinhos was sent off towards the end of the first half, so Santos were facing the last 45 minutes with only 9 players. For the 35,000 present the second half was the longest 45 minutes of their life. Santos defended grimly but were under intense pressure for most of the time. Dorival took of both Robinho and Neymar, bringing on Andre and a defensive midfield player. The pressure intensified in the 38th minute when Santos had another man sent off leaving them playing with only 8 men, against 10. Dorival immediately took off Andre, meaning attacking Santos had no forward on the park. Somehow the last 10 minutes passed with no Santo Andre goal and at the final whistle the Santos celebrations were finally able to start. 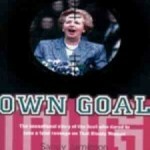 It would have been a travesty of justice if their goal laden campaign had not ended up with them crowned champions. The players frantic celebrations were led by Neymar. He may only be 18 years old but he is already the natural leader both on and off the pitch. Man of the match for Santos was midfielder Paulo Henrique Ganso who probably added another couple of million to the transfer fee needed to take him to Europe. He is a great talent though and surely some big European club will buy him. Long time capital of Brazil, at least in a football sense the past two decades have seen Rio eclipsed as the powerhouse of Brazilian football by Sao Paulo, whose big 4 teams have been better organised and better managed than the 4 traditional Rio giants Flamengo, Fluminense, Botafogo and Vasco de Gama. In recent years the last 3 of these clubs have spent spells in the Second Division, a fate once unthinkable and until recent years prevented by unwritten laws protecting the big clubs. Even Flamengo, the best supported club in Brazil, if not the world, with an estimated 40 million supporters came dangerously close to relegation in recent years but finally, in 2009, they restored themselves to the top spot in Brazilian football with a dramatic clinching of the League title on the very last day of the season. This triumph qualified them for the 2010 Copa Libertadores, which became a much greater priority for them than the State title. This opened the door to the other 3 clubs to restore a little of their tattered prestige with a State triumph. The club who rose best to this challenge was Botafogo. Once one of the top clubs in the world, with a front 5 of Garrincha, Didi, Vava, Amarildo and Zagalo all legends and World Cup winners, recent years have been hard and drab for supporters of the team in black and white stripes. This year however under the management of Joel Santana last seen by LSA readers fleeing Flamengo to take the job of ensuring South Africa performed creditably in the 2010 World Cup (see Letter from South America Butterfly Wings April 2008). His spell in charge of the Bafana Bafana did not work out and he returned home in 2009 to take the reins at Botafogo. The Rio State League is organised into two separate mini-league stages. The first one the Taca Guanabara saw Botafogo defeat Flamengo in the semi-finals before meeting an defeating Flu?/ in the final. The second tournament is called the Taca Rio and the rules allow for the two winners to meet in a two legged final for the overall State championship. However the rules also state that if the same club win both Tacas then they are automatically deemed State champions without any further final. So when both Botafogo and Flamengo qualified for the Final of the Taca Rio, Botafogo knew victory would make them champions while Flamengo knew victory would require them to play two more demanding games just when their Libertadores campaign was warming up. So it was no great surprise when Botafogo won the Taca Rio 2-1 and were crowned State champions leaving Flamengo free to concentrate on qualification for the knock out phase of the Copa Libertadores. The two Botafogo goals were scored by Argentinean Herrera and Uruguayan Abreu, know as El Loco the mad one. Flamengo’s star, Adriano capped a bad afternoon by missing a penalty late in the second half. The third most important State championship is that of Minas Geras traditionally fought out between the Big Two, Cruzeiro and Atletico Mineiro both from the capital Belo Horizonte. The last Brazilian Championship saw Cruzeiro qualify for the Libertadores but Atletico miss out after having been in the top four most of the season. As usual in Brazil, this meant Cruzeiro had the State league a very poor second priority to advancement in the Copa Libertadores. Even so they did get to the Semi-Finals.They drew the first leg, away to Ipitinga 0-0 and it seemed set for another classico final with Atletico Mineiro. For the second leg the Cruzeiro manager, Adilson rested 6 of his players but still expected his side to win. However Ipitinga had not read the script and dumped Cruzeiro out of the competition by winning 3-1 in front of their disgruntled fans. However Ipitinga were not able to repeat the trick in the two legged Final against Atletico Mineiro and the big boys comfortable won over the two legs. They won the first leg away 3-2 then won even more comfortably at home by 2-0. Atletico Mineiro are coached by Wanderley Luxemburgo, probably the most successful Brazilian coach of the last 20 years. He is the man who enhanced Rafael Scheidt’s transfer value by capping him 3 times for Brazil (See “Kaka presentation revives memories of post July 2009 for the scurrilous explanation for these strange events). Few of their players will be familiar to European football fans except maybe forward Diego Tardelli who played for Real Betis. The fourth major State League is that of Rio Grande, almost always contested by the Big Two of Internacional and Gremio, both of Porte Alegre. Both these clubs have won the World Club Cup in recent years so they have to be ranked as amongst the biggest clubs in the world, but none of their state rivals ever come close. Even with Inter PA giving clear priority to the Copa Libertadores, they managed to squeak into the Final but the greater focus, determination and priority of Gremio proved effective and the men in blue and black won the title. It was close though with both teams losing their home game and Gremio only being declared champions on goal difference, winning 2-0 away but then losing 1-0 in their home leg. None of the other 20 odd State leagues have the prestige of the big four and none of them contain any of the Big 12 clubs of Brazil. In Bahia State, Vitoria of Bahia beat every Carnival lover’s favourite team Bahia over two legs, again needing league countback to prevail over their Second Division rivals. In Parana State Coritba, along with Bahia, Guarani andAtletico Parana, the only 4 clubs outwith the Big 12 to ever win the Brazilian League, restored some pride by capturing the State League, following their disastrous and unexpected relegation on the last day of the 2009 Brazilian Championship. In Goiana, Atletico Goiana were the surprise winners over the better run Goias FC who nearly won the Brazilian League a few seasons ago. It should be that the winners of the semi-final between Santos and Gremio will go on to secure that coveted Libertadores qualification but nothing is guaranteed and the final is not due to take place until after Robinho’s loan period in Santos expires. Neymar may also have moved on by then if a 50-60 million euro bid is made for him. All five Brazilian clubs who qualified for the Libertadores Cup made it through to the knock-out stages. Four of the five have made it through to the Quarter-Finals, with only Corinthians dropping out, eliminated over two close games by old rivals Flamengo. In the Quarter-Finals Sao Paulo and Cruzeiro clash, with Inter PA facing holders Estudiantes and Flamengo having a seemingly easier task against Pellegrini’s old club Universidad de Chile. Next week LSA will give a more detailed analysis of the 2010 Copa Libertadores including tipping the likely winners. 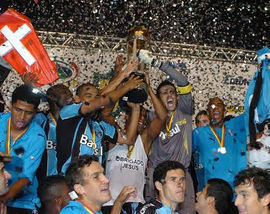 This weekend saw the start of the 2010 Brazilian League championship. For once all of the Big 12 are present and it is almost certain that one of them will win. GGW would not bet on Vasco da Gama, Fluminense, Botafogo, Palmeiras, Santos, Gremio or Atletico Mineiro. Nor are Flamengo likely to retain their title. So that only leave 4 teams worth backing Sao Paulo, Inter PA, Cruzeiro and Corinthians. A LSA in the next few weeks wil report how the championship has started and which team should be supported to win it.